I did some work today with some people who make football kit. I haven’t worn any football kit since 1981 when my Games lessons stopped being compulsory. But when I went into their archive room and saw some of the stuff they had there, I was transported back to the mid-seventies. In 1975, Birmingham City Football Club celebrated its centenary and a year later they replaced the early-seventies penguin strip with a plain royal blue jersey with white collar adding a two-globe centenary badge – I can still see Trevor Francis in that kit, before he betrayed us all to become the first million-pound footballer for that bugger Brian Clough. Why did I support the Blues? You had to. No, really at the junior school I went to, you really had to. A teacher was spat at once for coming to school wearing a Villa scarf. A teacher. In 1975. Y’know, before Grange Hill, in the days when teachers commanded respect and could give you a good hiding if you didn’t buckle down. You can imagine what would have happened to any mere boy who dared even consider anything claret and sky blue. Football shirts – social objects, pulling a trivial little story out of me, reminding us how we felt, creating the opportunity for connection. And that’s just for me, I don’t even care very much for football any more, what about the real fans? And then there’s the programmes and the magazines, and the boots and the letters and the photographs. These people have a delicious slice of our popular culture in their care, I hope they get to start blogging about it soon. I’m talking to some lovely folk at a top-secret location somewhere in the North-West of England. 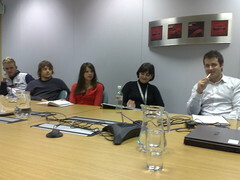 We’re talking about the social web and how they might use it. This blogpost is an example. While I’m writing this they are all sitting quietly and I’m also uploading some pictures to flickr. I’m showing them how I write a post – and forgetting half the time that I’m doing that and that I should explain more what I’m doing at the time. 11 minutes past midnight. Bloody hotels.